One of the top wedding venues in downtown Toronto, Ontario, is the Liberty Grand Entertainment Complex. This location is known for its beautiful architecture, sincere and efficient staff, and exquisite cuisine. Not only is this location absolutely stunning in the fall, it remains charming all year round. Furthermore, it offers a variety of areas where a bride and her groom can tie the knot. Liberty Grand is one of Toronto’s few traditional ballrooms, the three rooms include the Governors Room, the Artifacts Room, the Renaissance Room and Centennial Room, and finally the Courtyard. Each of these areas has the capacity to hold groups of one hundred and fifty to three thousand people—perfect for couples that are hosting a large event. Each room includes the finest imported furnishings, breathtaking domes and columns, crystal chandeliers, and arched windows. These are all qualities that give an authentically historic atmosphere. 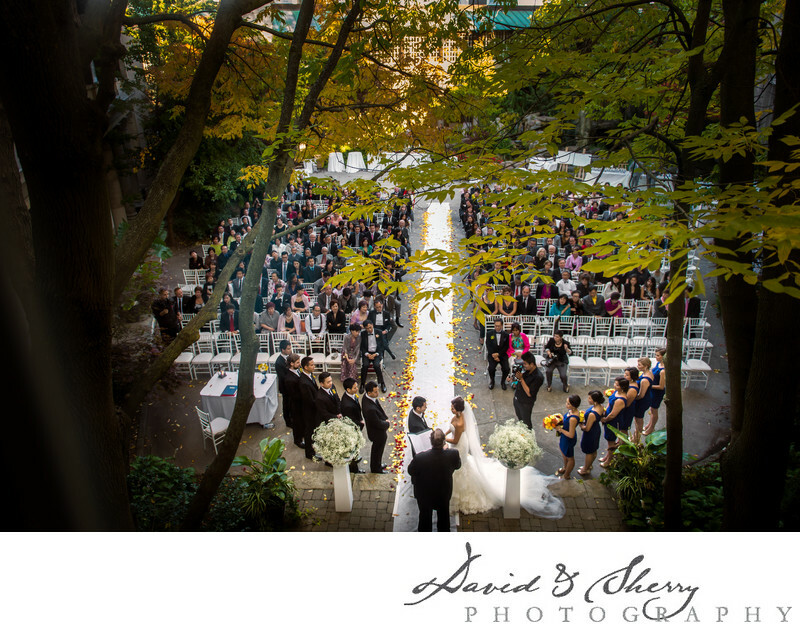 This image of the bride and groom saying their vows was captured from an above balcony overlooking the yard. The autumn leaves framing the couple, groomsmen, bridesmaids, and guests, as well as the buildings surrounding them, made for outstanding photos. The space and its surroundings made the ceremony a very intimate and private occasion.